Look at these crochet needles on my spinning cloth. All are size 2,5 (mm I presume). If you don’t swatch very carefully when using a written pattern you may get very far from what you had planned, even when you use the suggested yarn. 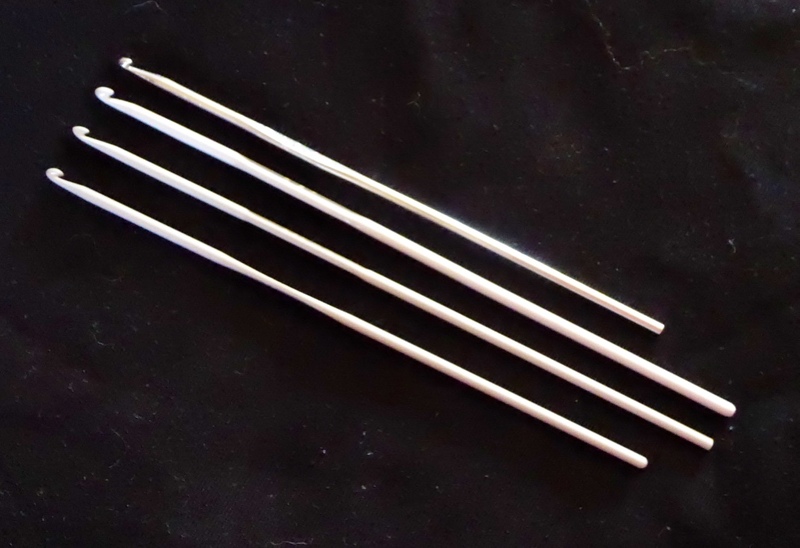 The three needles with the same thickness in the shaft have different hooks, so the result will be different if you change your needle to another in the middle of a project. Just for fun, have a look at different ways of sizing and numbering hooks. There are plenty of charts on internet. April 10, 2016 - 10:40 pm Marilyn F.
Yes, those crochet hooks visually all look alike, but you say they work up in different gauges. Its a good point to share and quite amazing that just a different crook in the hook will make a difference. You would think crocheting would be easier than knitting, as you are only working with one needle, but it seems sampling is important in both. I have not done enough crochet to know this so I appreciate the information. Thanks for sharing. Yes, they are different. The form of the neck and hook has a lot to do with how the crochet hook performs, and how it performs with different yarns and fibers like wool and cotton.